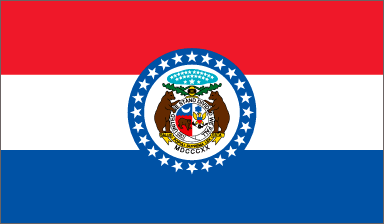 On August 10th, 1821, the state of Missouri became the 24th state admitted to the Union. It was carved from the territory that took its name from the Missouri River, so named for the Native American tribe that occupied its banks. Formed as a result of the Missouri Compromise, it was intended to balance the power of Slave states and Free states in the federal government. Containing the confluence of the Missouri and Mississippi rivers, the state had become the supply route and launching point for the westward expansion of American settlers. Both the Santa Fe and Oregon trails began in Missouri as well as the Pony Express and Overland Butterfield Mail Route. 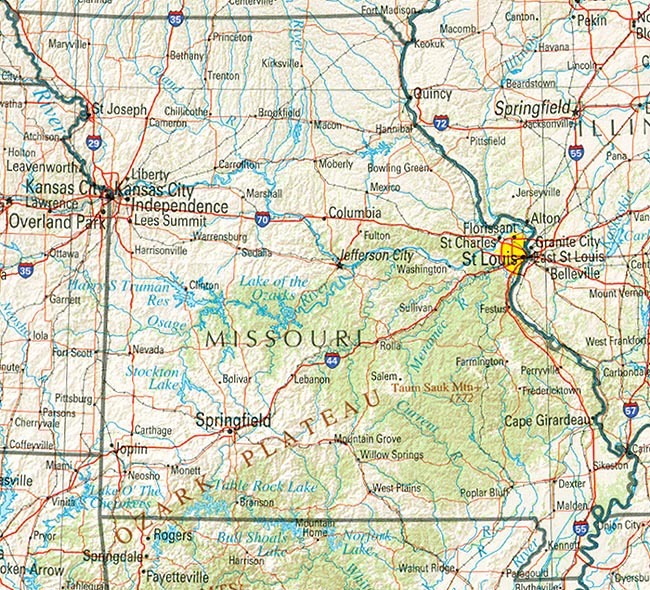 Physically, Missouri is comprised of three main areas: the Northern Plains extending north of the Missouri river; the Ozark Plateau which begins just south of the river and extends southward to Arkansas; and the southeastern part of the state which includes the ‘Bootheel’, part of the fertile Mississippi Alluvial Plain. Most Missourians consider their state part of Midwest but it was originally thought part of the South. Today, this distinction is generally divided among urban and rural lines, with many in the metropolitan areas of Kansas City and St. Louis regard the region as distinctively Midwestern. Missouri has a lower tax rate than any state it borders. It is primarily an agricultural state although it leads the nation in lead production and is one of the top producers of lime. The state is a perfect blend of North, South, East, and West. It has the same percentage of African-Americans as the nation as a whole, the same percentage of union workers, and the same rural/urban ratio. With the exception of the time it cast its lot with Adlai Stevenson in 1956, in every presidential election since 1900 Missouri has voted for the winner.